Fans will recognize a favorite core character in her signature outfit with hugely monsterrific details. 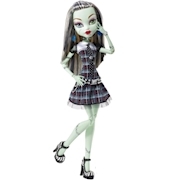 Frankie Stein™ doll, daughter of Frankenstein, looks voltageous in her iconic plaid dress. Uhhh-mazing accessories, like her to-die-for shoes, are inspired by her unique scaritage and killer style. Capture the large-scale ghoul in scary cool poses, or play out freaky flawed tales. The 17-inch doll comes with a doll stand to capture a memorable moment. Collect her ghoulfriends to build "up" your Monster High™ world (each sold separately).